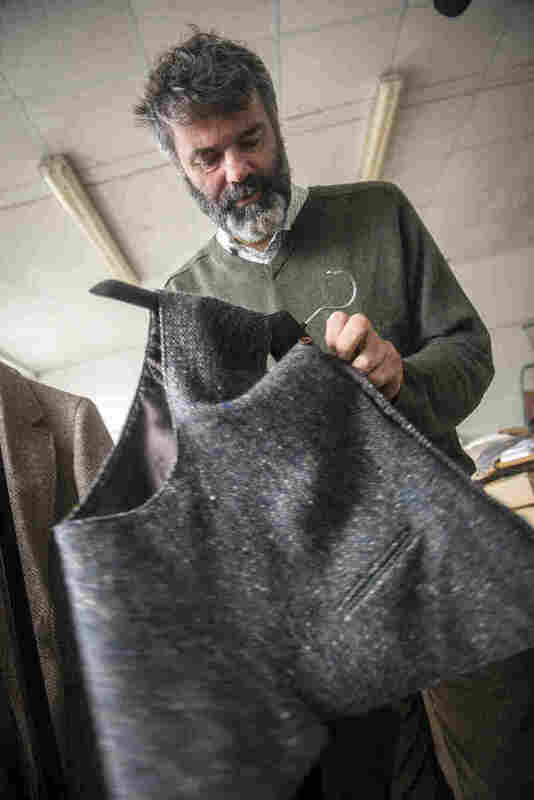 Irish Tweed: Hand-Looming With A Modern Twist Studio Donegal in Ireland is the tweed manufacturing equivalent of a micro-brewery. The small mill is weaving authentic tweed garments, helping to revive an old Irish tradition. 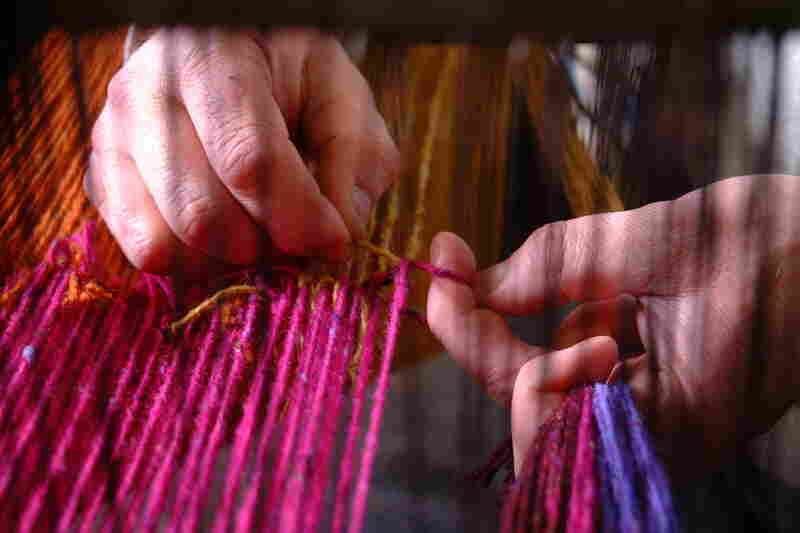 Contemporary yarns used an array of modern colors, like fuchsia, but still echo Irish traditions. These are hand-spun at Studio Donegal in Ireland. 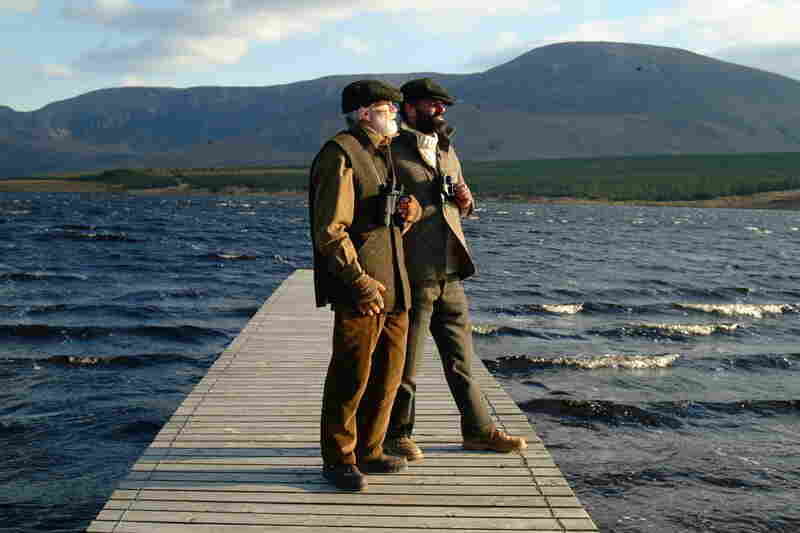 Tristan Donaghy and his father Kevin Donaghy, co-owners of Studio Donegal, wearing some of their hand-loomed tweed as they stand before the Slieve League mountain in northwest Ireland. Tristan Donaghy, co-owner of Studio Donegal in northwest Ireland hand-looms vests like these and ship them all over the world. 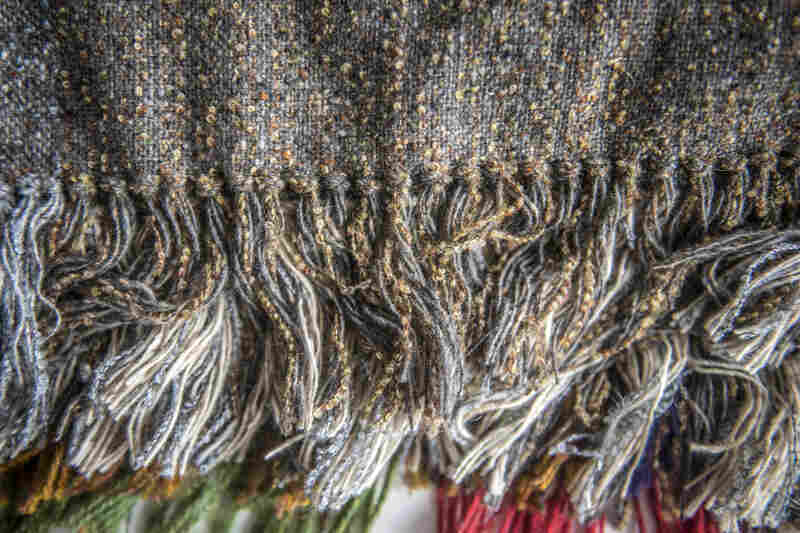 These modern tweed scarves made from soft Merino sheep's wool are woven at Studio Donegal in Ireland. 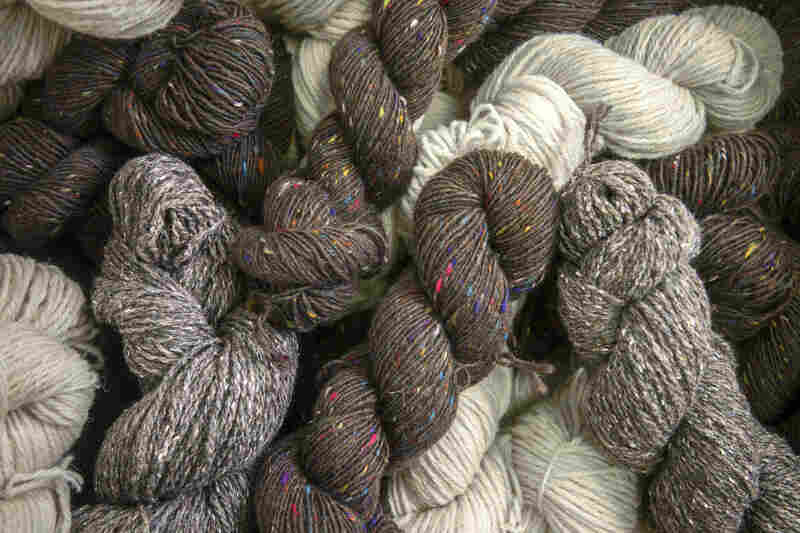 Skeins of hand-spun tweed yarns are obtained locally and used at Studio Donegal in Ireland. 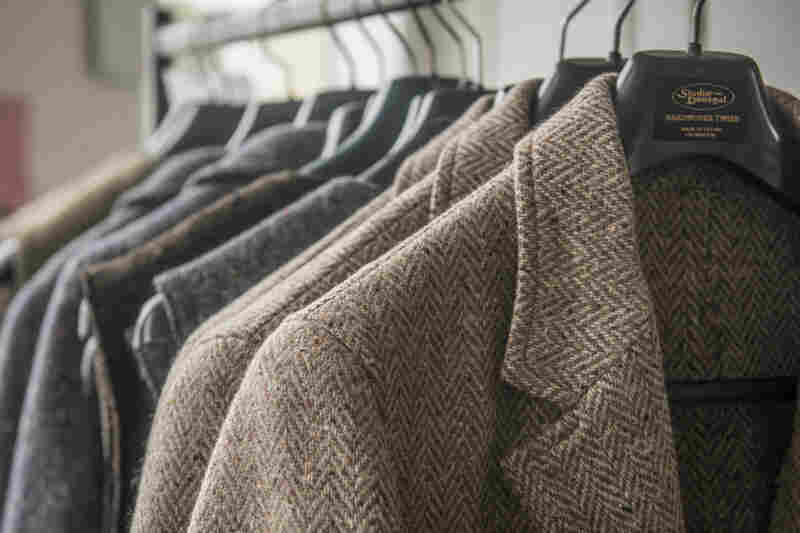 Tweed jackets hand-loomed at Studio Donegal in northwest Ireland. County Donegal, a region of breath-taking beauty in Northwest of Ireland is synonymous with tweed. For centuries, every farm hand-loomed its own wool after harvest. Now, most of that tweed is machine-made at a commercial mill. But at a bend in the road, in a tiny village called Kilcar, is Studio Donegal Spinners & Handweavers, where hand-looming is flourishing. The woolen mill and retail operation was founded by the Donaghy family in 1979, reviving the labor-intensive practice of hand-looming. There are other, bigger commercial operations, but very few handweavers anymore-- and Tristan Donaghy says his small mill produces the best. "Anybody who wants to call their tweed hand-woven, fair enough, if it is," Donaghy says. "But we're the standard bearer. So you know, if you're going to make handwoven tweed — and it may be a bit cheeky of me - you've got to be as good as me." He employs about 15 people. "Use your indigenous skills," Tristan Donaghy, co-owner and handweaver of Studio Donegal in Ireland. Tweed is a color-flecked or tightly patterned woven wool yarn and an Irish and Scottish tradition. Studio Donegal still uses handspun yarn — a bit of it spun on Victorian spindles or old machinery is used for special blankets. But the softest sheep's wool is merino or crossbred from Australia and South America. "Irish wool would take the back off your legs," says Donaghy, whose father Kevin spent a lifetime in England in textiles before returning to Donegal. The cottage industry in Ireland had largely disappeared by the mid-20th century and textile manufacturing plummeted, primarily because of globalization. When the Donaghy's took over the mill, hand-weaving had ceased altogether and jobs were scarce. The company wanted to boost textile jobs in Donegal. "Use your indigenous skills," Donaghy recalls saying. "I mean, if I produced old hard tweed, such as was produced a hundred years ago, there'd be no future. I've got to produce beautiful things." And they do-- blankets, jackets, scarves, caps, for clients as far away as Germany and Japan. Visitors can buy them in a small gallery, or observe the weaving. Wooden looms don't look a lot different than they did hundreds of years ago. Big, boxy things-- guided by hand. John Heena, who's in his 50s, hand-looms tweeds the way his ancestors did. "The small town that I came from, there were six houses and eight handloom weavers," Heena says, while weaving a classic Herringbone tweed pattern. "It was the first thing I'd ever seen in me life, like. I grew up sitting on the seat of me father, like. He died as a young man of a massive heart attack. Actually there was no electricity then. They worked under the power of an oil lamp." There's a new generation now. Beside Heena is 24-year-old Kevin McGillicuddy, another weaver, whose uncle was a also handweaver. He was making a pattern called American spiral --- a brilliant red diamond on a grey background. In a five-day week he can weave about 100 meters of cloth-- enough for 45 jackets. Studio Donegal weaves roughly 10,000 meters of cloth a year. That's only a fraction of what a commercial house would make. But owner Tristan Donaghy says Studio Donegal is doing well, selling to clients, visitors and online, making an old-fashioned product. A jacket sells for about $400. "As I keep saying to young people who come in, this isn't a jacket for an office dandy with a flower in his lapel," he says. "This is a jacket for a real modern man. Because come evening he can turn his collar up, put his lapel across, run home keeping warm, and when he gets home, he can roll up his sleeves and help with the dishes." Now that is a twist of the modern on Irish tweed! Jacki Lyden is the host of The Seams podcast, and The Seams, an occasional series on fashion as culture on NPR.